Athens; its haunting history and cultural heritage somehow tells the story of us all. Western democracy gets its bearings here. From the classical, unrivalled beauty of the Acropolis to its newly paved chic shopping strips, Athens now oozes a level of confidence and charm befitting its famous ancient landmarks. And we can largely thank the latest Olympics for that. There is nothing like the five-ringed circus to rejuvenate civic pride and instigate a mammoth public works program, some would say centuries overdue. The result means that Greece’s capital has come of age. Again. And for today’s visitors, gone are the legendary gnarled traffic jams, lung busting smog, ear splitting horns and death defying taxi drivers. In their place is a thoroughly cosmopolitan city that will beguile you with its vibrancy, energy and host of hidden treasures (both old and new). Where do you start when the who’s who of classical antiquity are clustered on or around a limestone outcrop in the city’s centre, otherwise known as the Acropolis (or ‘high city’). Dominating the Acropolis is the Parthenon, surely one of the world’s most recognisable ruins. Or at least “the world’s most perfect poem in stone,” according to French poet, Lamartine. No amount of assiduous high school study or brochure browsing can prepare you for the real thing. Up close and personal it defines awe. Built to honour the incarnation of Athena as virgin goddess, its mathematically precise and inward sloping proportions were completed in 438 BC, just nine years after construction commenced. Come early in the day when visiting to avoid crowds and the relentless heat. Linger, wander and just wonder at its sheer magnificence. A cobbled walkway connecting the main archaeological sites is the one Olympian legacy even the locals have taken to heart. The rather unimaginatively named Unification of Archaeological Sites Walkway has turned pot-holed roads and congested footpaths into a 4km pedestrian-only thoroughfare now lined with cafes, restored neo-classical villas, street entertainers, flower beds and the occasional maverick moped rider. What was once a marathon exercise in survival is now a relaxed and peaceful stroll linking the Temple of Olympian Zeus, the Acropolis, Filopappou Hill, Roman Forum, Hadrian’s Library, Ancient Agora and eventually past the neocropolis of Kerameikos. Best done in small segments, over several days, like a satisfying jigsaw, because only on completion do you get a proper appreciation of the bigger picture. Start at Thissio metro station and stroll following your caffeine and shopping senses through centuries of Greek history at the Monastiraki flea market. 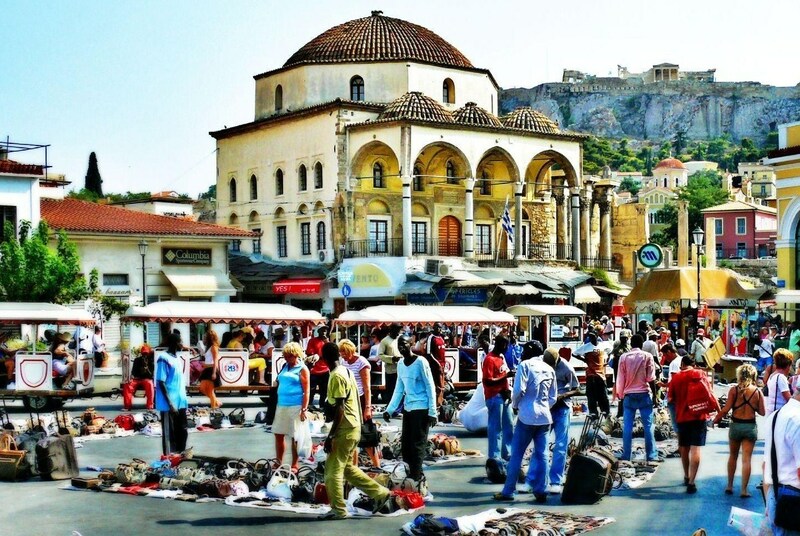 Tucked away in the northern shadows of the Acropolis, and lining one side of the Ancient Agora (where Socrates and his cohorts debated the big questions in life) the flea market – an Athenian institution – is reason enough to include a Sunday in your itinerary. Antiquarian ceramic replicas, Ottoman tea sets, writing quills and hand-made leather sandals sit juxtaposed beside excess Olympian souvenirs (and just about everything in between). Cafes and cornucopia from across the world line the shaded walkways. Turn left; turn right, you don’t need a map; just an appetite for adventure and a taste for Greek culture. Locals love koulouri for breakfast, a sesame-studded bread ring bought from street-side stalls and consumed on the move. But for that truly Greek treat on the go, try a giro (pronounced yee-roh) anytime of day: a warmed pita bread pocket stuffed with lamb shavings, grilled onions and tzatziki dressing. Fries are optional. They abound everywhere, but O Thanasis at 67 Mitropoleos kept me coming back more times than I’d like to mention to my dietician. Although every guide book mentions it. And everyone who’s been to Athens seems to know of it, you still can’t go past Café Avissinia for that traditional Greek feast. Befitting its bustling location in the heart of the Monastiraki flea market (see Sunday morning option), the two-level café conjures a distinct Byzantine atmosphere with a touch of the ‘bohemian’ added when the resident gypsy diva belts out tunes for carefree weekend diners. Quick history lesson: The Parthenon (see Best ruin) contained numerous architectural adornements, including ornate metopes and friezes portraying characters and incidents from Greek mythology. Their detail and design were supposedly unsurpassed in antiquity. And naturally attracted great interest among vandals and colonising armies over the centuries. One of the biggest ‘acquisitions’ was commissioned by the seventh Earl of Elgin in the19th century (he was ambassador to Constantinople at the time). His extensive and valuable haul is housed in the British Museum. 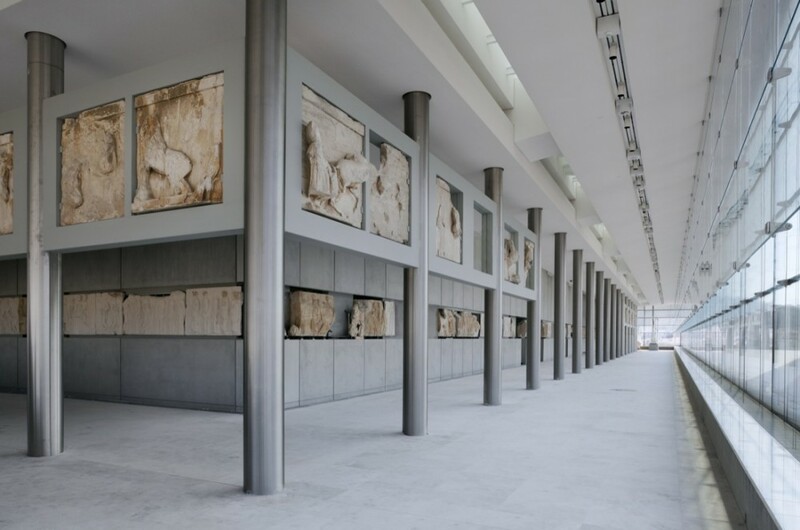 And is the subject of much controversy with international calls for their return home, now that the Greek Culture Ministry has built a huge new Acropolis Museum in Makrygianni, apparently with purpose built space and cutting edge display technology to house the Elgin Marbles in all their original glory. You won’t find a giant ferris wheel, TV tower or skyscraper rooftop to scale in order for some elevated views. Better still, a 300m high hill in the city centre, complete with pine forest and shaded woodland paths provides the perfect vantage from which to get the best Athenian perspective: Lycabettus Hill. The walk is winding and a little tiring, so take the funicular. Time your arrival for sunset, grab a table at the elegant Orizondes restaurant and drink in a view right across the sprawling city, down to the port and across the Saronic Gulf. London has Chelsea; Los Angeles has Rodeo Drive; Shanghai, The Bund. And now Athens has Kolonaki, a very trendy café and shopping precinct home to all manner of media/model wannabes, lunch lovers, elite geeks and four-wheel drive owners. The sound of mobiles ringing is only outpaced by the ding of cash registers or the rattle of bling. And as befits such a neighbourhood, there’s a café of commensurate kudos from which to witness Kolonaki’s comings and goings: Da Capo. They say more business deals are done over cappuccino in the stylish surrounds of Da Capo than in any Athenian boardroom. That may be so but for the casual visitor, the pastries and coffee are worth the jaunt to Kolonaki alone.